April 23, 2019: The School Board passed two resolutions anticipating the first sale of bonds in July 2019 to move forward with construction of new buildings: Resolution 15 and Resolution 16. March 26, 2019: The bid for the Challenger High School Phase II project has been awarded to Christensen, Inc of Tumwater, Washington. March 12, 2019: NAC Architecture of Seattle, Washington has been selected as the design team for the new Bethel High School. A lot has happened since voters passed our bond in February. With 66.14% of the community approving the bond and standing behind the need for new schools in our area, we didn’t want to waste any time getting the construction process underway. A sign recently went up on Waller Road announcing the location of Elementary #18. This formerly Pierce County land is on Waller Road between Military Road and 176th. Geographically speaking, it’s a great location when you consider traffic flow and the distribution of students among the other elementary schools in the area. We are very excited it will soon be home to staff and students when it opens in September 2021. Elementary #19 is currently scheduled to be built in the Lipoma Firs community. The land is not ready to be built on yet, and is part of the final phase of DR Horton’s development schedule. They are currently estimating the site will be done (graded, roads built, utilities installed) in late 2022, which means school construction can start in early 2023 and opening in September of 2024. The design team has been selected and the process of designing the new Bethel High School is underway. Because high schools are large buildings it will take about two years to design it and get it permitted followed by two years of construction. We look forward to the new BHS opening the fall of 2023. In other construction news, Phase I* of the new Challenger High School is set to begin any day now. You’ll be able to follow the progress of this project with our streaming construction camera which will be up and running soon. We are planning on streaming all the other bond-funded construction projects as well, so you can keep up with the construction progress. *Phase I of Challenger High School is not a 2019 Bond Project. It is being funded through the General Fund. Phase II of Challenger High School is a bond project. “Just because we passed the bond doesn’t mean we move into new schools next week,” School Board member John Manning said. The construction calendar not only reflects the planning, permitting and construction process for each project, it also shows how the bonds will be sold over time so as to to keep the tax rate fairly consistent for voters. Planning and permitting for Elementary School #18 on Waller Road has begun and the building is expected to be completed in time to kick off the 2021/22 school year. Planning and permitting for the new Bethel High School will begin soon. It is expected to be opened for the start of the 2023/24 school year. That same year, Graham-Kapowsin High School’s new wing and expansion of existing common spaces is also expected to be completed. The construction project the community will see happening first is Phase 1 of Challenger High School, which was funded through the district’s general fund last year. That project is expected to be completed later this year, and will begin housing students in early 2020. Phase 2 of Challenger will be bond-funded and is expected to be open for the 2022/23 school year. The renovation and expansion projects at Cedarcrest, Evergreen, and Naches Trail will wait until students and staff from Bethel High School move into their new school building in 2023. 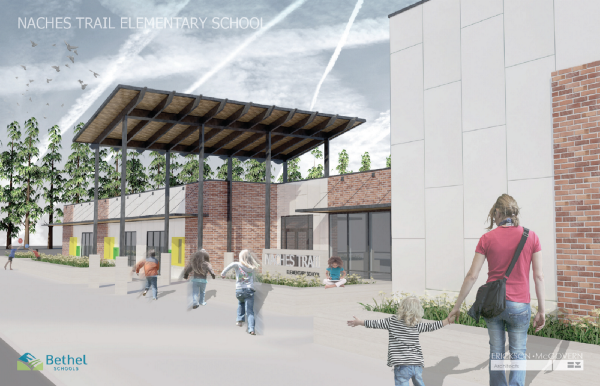 Beginning in 2023, the old BHS building will be used as a “swing school.” This will allow students and staff from Cedarcrest, Evergreen, and Naches Trail to move out of their current buildings while construction crews get to work. Once the old Bethel High School building is finished being a swing school, it is scheduled to be renovated and then will be used for the needs of the district at that time. It could become anything from a magnet high school to a preschool center. That decision will be made at a later date by the School Board. There are a number of other projects that will be funded with the 2019 bond money. You can see them all on the construction calendar. As more information becomes available, we will continue to provide updates throughout the next ten years of bond-funded construction in Bethel.